I would be lying if I told you I was calm and collected when I received a pm on Instagram from a writer at the New York Times. I immediately checked out the writer's articles and was blown away; Ashley Longshore, Isabella Rossellini, and Brooke Shields to name a few. Her message read: may I contact you for a New York Times feature? I did not take long to say, why yes... you may! After a 30 minute interview, with Ruth La Ferla, who was a delight, the rest is history! You can read the article here. 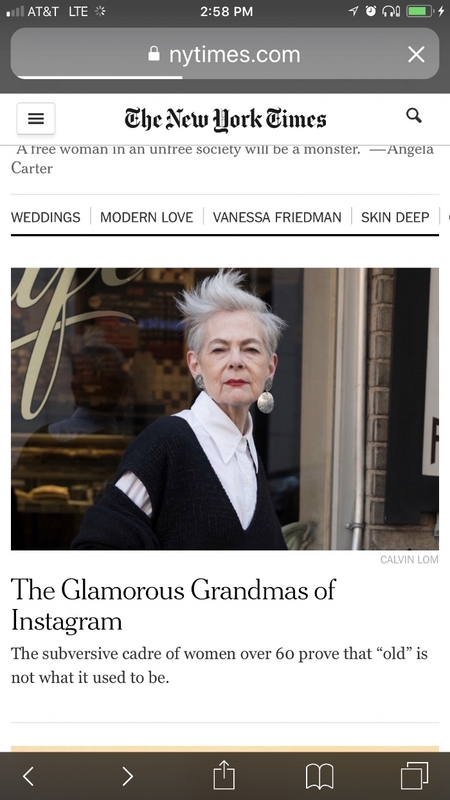 I am honored and humbled to be among the other Fabulous Grandmas of Instagram! And sincerely believe that aging is the new frontier and that we have to re-write the rules for future generations. My motto is: Embrace Aging! Have a great rest of the week and thank you for reading the blog. My goal is to share chic, ageless style and endless fun, from a sincerely silver perspective! I appreciate you!